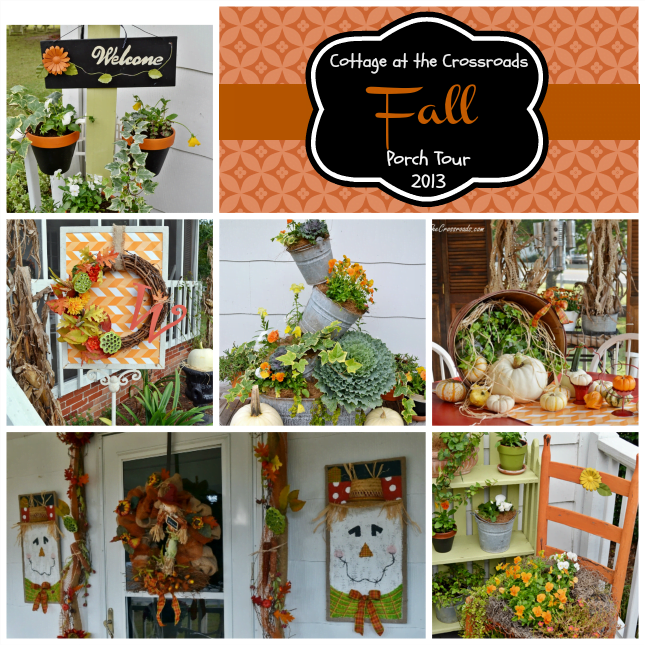 Welcome to Our Fall Porch Tour! Leo and I are so happy to be participating in the fall porch tour put together by the lovely and talented Barb of the blog The Everyday Home. 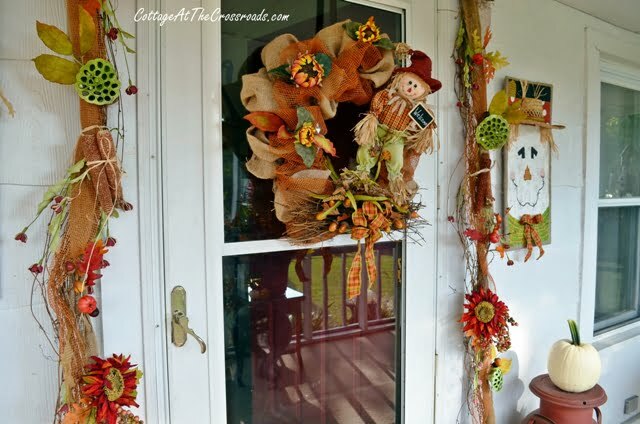 The first thing that you’ll see after you step up onto the screened porch is this scarecrow wreath and garland that’s around our front door. Have I mentioned yet how much I love scarecrows? Well, I like them so much that I painted two of them this year! 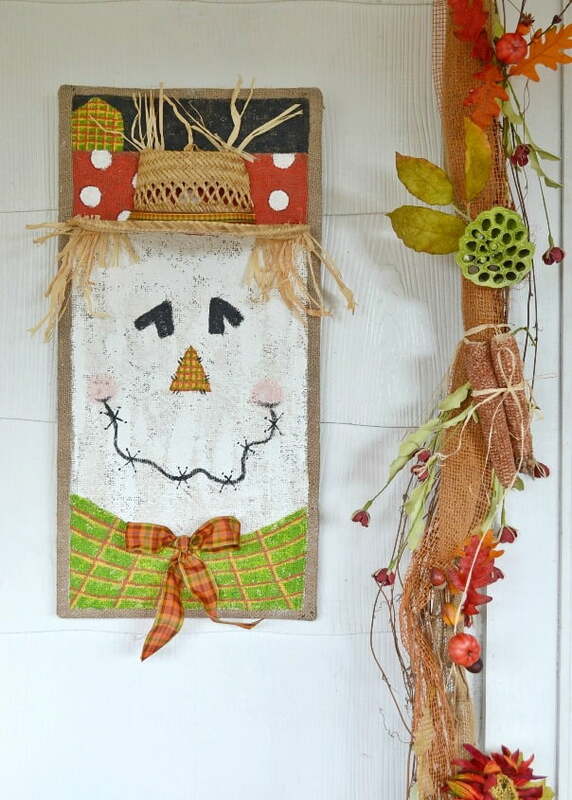 The directions on how I did it can be found in the post How To Paint Scarecrows on Burlap. On the porch is this really cool stand that I found earlier this fall. It was outside for a while, but I brought it inside when we had some rain. Some of you have already seen our Tin Man that we have hanging on our porch. How can you have scarecrows without having a Tin Man? I saw him in Magnolia’s restaurant in our little town, and he had to come home with me. I’m so glad you stopped by because I was just setting the table on the porch for dinner. While I was in the painting mood, I whipped up this new pillow. Well, the pumpkin is new, but the pillow isn’t. It’s been around for quite a few years. And while I was in the pillow making mood, I put this pillow together with a free printable that I created recently. It was a no-sew project because I glued the canvas onto an old pillow and tied the corners with twine. This scarecrow girl is guarding the mum and there’s a little crystal scarecrow ornament on the table, too. Her boyfriend is hanging out here in the ivy! Did I mention that I have a thing about scarecrows? Now that you’ve seen our front porch, I must take you out the back door onto our little deck. Yep! 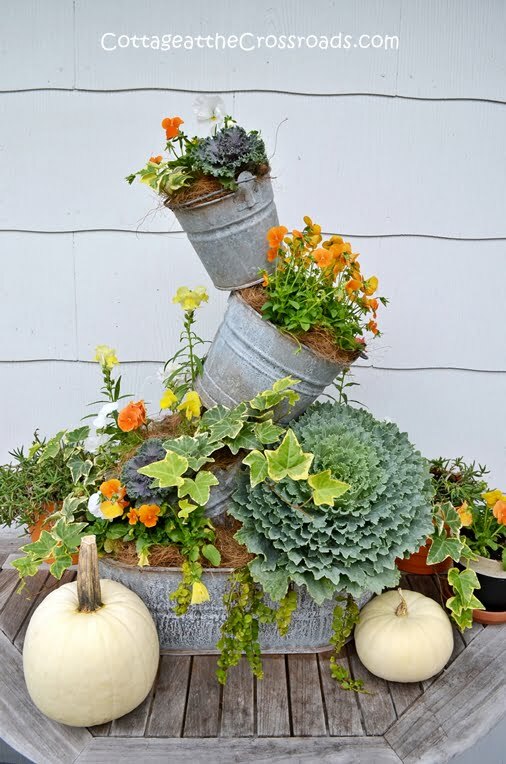 The topsy turvy planter has been recently updated with some fall plants. It was really pretty all summer, but it was time to freshen it up for fall. In case you’d like to make your own, the directions can be found in the post Topsy Turvy Galvanized Buckets. The pot holder stand was freshened up too with some plants that will live all winter. If you’ve been looking for those little plastic pot holders, we sell them in our SHOP. Isn’t it amazing the impact that fresh plants have? 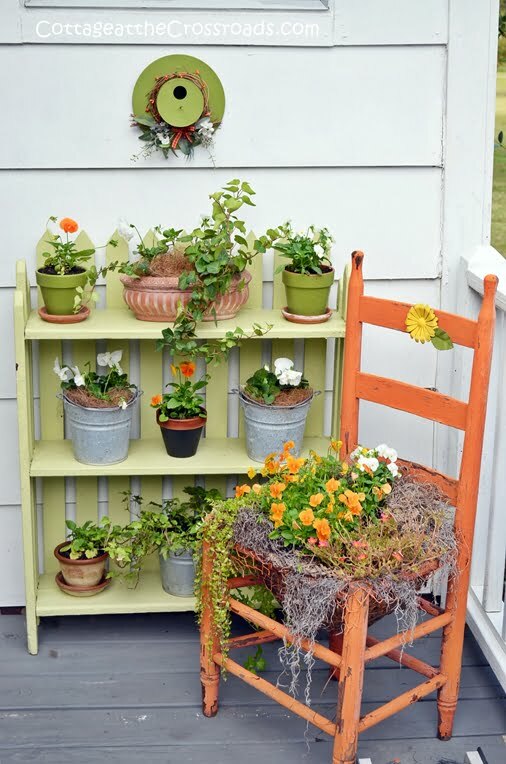 The little bookcase, as well as the chair planter, look totally refreshed. Even the little birdhouse got dressed for fall. These 2 strawberry pots were replanted with succulents a few weeks ago. I tucked them under the table so that they wouldn’t get too much rainfall. This little planter has been planted with snapdragons and pansies. They don’t look like much right now but they will put on quite a show in the spring. Are you wondering about all the white pumpkins in the photos? We grew them in our garden this year! And if you had more time, I’d take you out into the garden where our fall vegetables are growing. But it’s time to say good-bye now so that you can visit some other blogs on today’s tour. And if you missed any of the porches on yesterday’s tour, just click the links below. Everything looks so cute. I have scarecrows also. It is all absolutely delightful Jane! 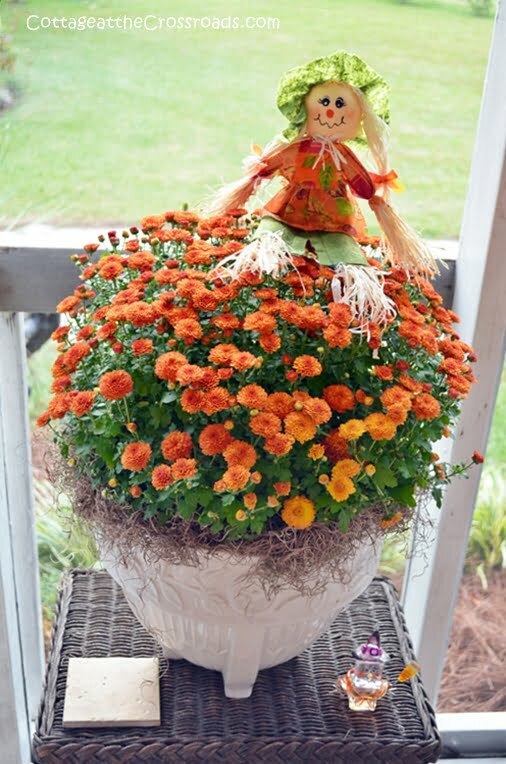 I remember your fab planter from this summer and it looks great dressed for fall! 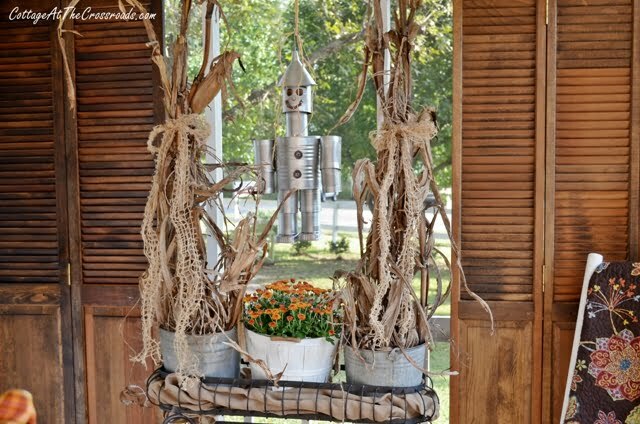 So many details and great autumn touches, and I love love love your scarecrow! 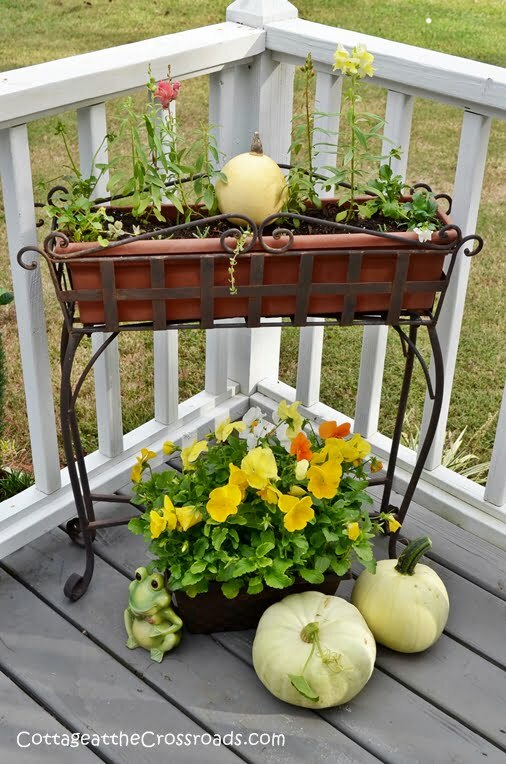 Love it all Jane…especially the galvanized triple decker planter! Cute cute, Leo and Jane. Would love to hang out on your porch. Oh my gosh…I love so many things on your porch. My favorite has to be the sign that your wreath is hanging on. Fantastic idea! I love your porch decor. I really LOVE the garland around the door! Everything is so pretty and welcoming. I would love to see what you do for Christmas. Thanks for the inspiration. What a gorgeous bounty of Fall favorites! Lovely porch!! That is a great photo of you two welcoming us! 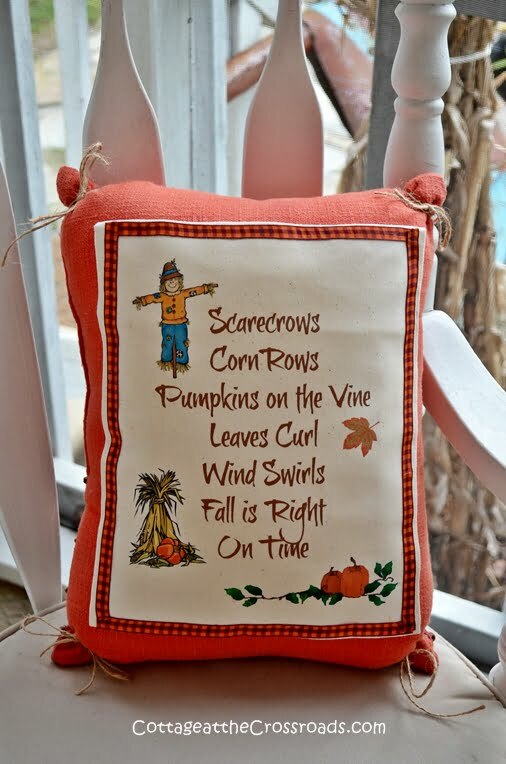 Everything looks fallishly delightful on your autumn porch! Everything is so beautiful! You put so much hard work into it. Very inspiring!! Jane, I LOVE everything about y our home for fall. You have done an outstanding job. That wreath and garland are so pretty and what you did with the topsy turvey planter is amazing!!! Jane and Leo- I adore your porch. I too love some scarecrows and well you had me at the tin man. 🙂 I also love the dark shutters you have at the end – is that to keep a sun glare down? Might have to do that when we get back to NC. Our front porch gets beat by the sun in late afternoon. It is lovely Jane! 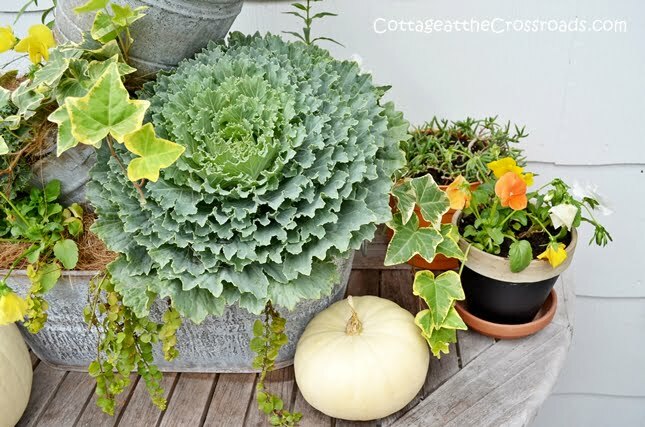 Love that topsy turvy planter! The pillows are awesome too! Love both of those ideas! Everything looks great, it is a welcoming fall porch! 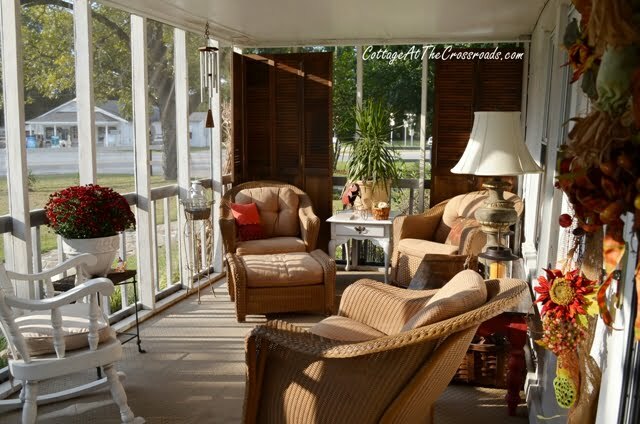 Your blog is new to me and was found through the Fall Porch series going on. I think I would feel right at home on your porch! I love to garden and hope to grow pumpkins next year. Your white ones are fun! Oh my goodness Jane – you have so many cute projects that it’s hard for me to know where to start. First off – you are quite the talented painter. The scarecrow on burlap so stinkin’ adorable! Love the planters, the wreaths, your table setting and everything. You have dressed your porches so wonderfully for Fall..I am sure that the entire outside of the house is fantastic….Love seeing all of your great projects…and I would love to see a larger pic of the Tin Man….would you be able to tell us how it is constructed….love it!…Great pic of you and Leo!!!! 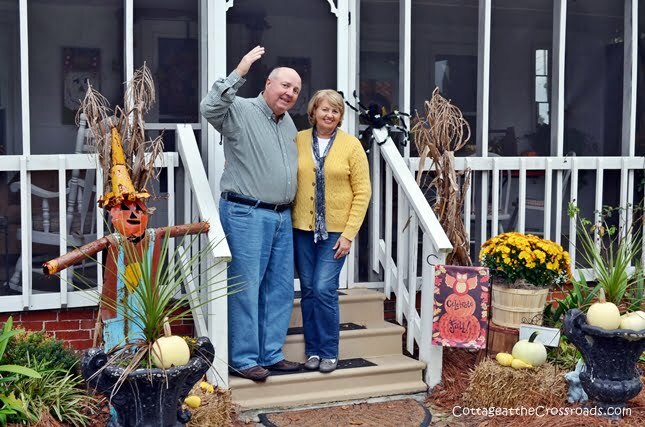 … Happy Fall..
Jane & Leo: I love both your porches! They’re both so welcoming. And can I just say, I love all your little scarecrows and the tin man, too. Your plants are amazing. I wish I had your talent in the garden. But you have inspired me to finally start sprucing up the back porch as I’ve been planning to do. It is not a pretty sight. I’m so happy to be porch sitting with you today. 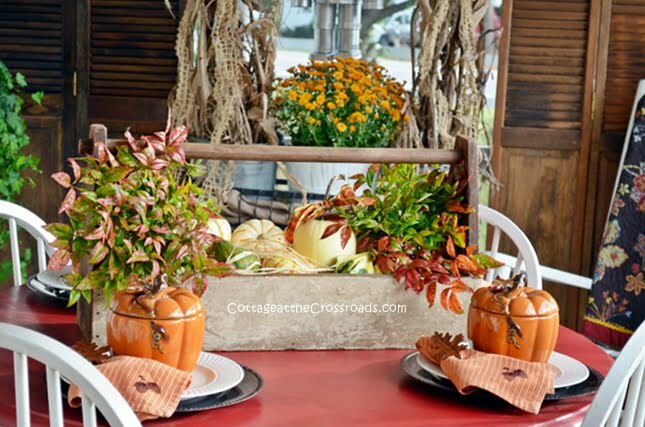 Your Fall decor looks festive and your porch relaxing! I love your style: never over the top and always practical. Wishing you & Leo many warm and sunny Autumn days! You and Leo are so darn cute! 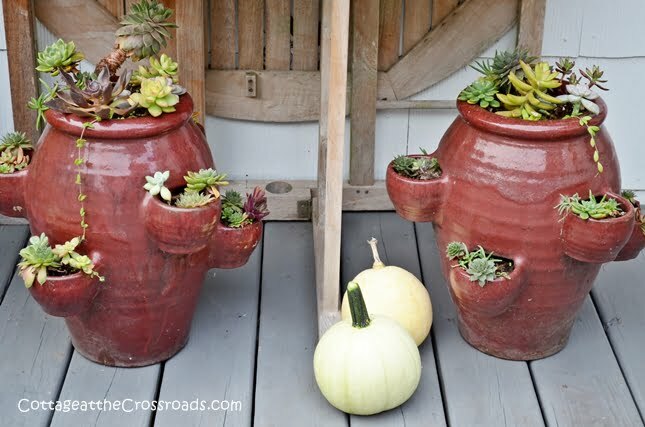 I adore that fall tipsy planter!!! 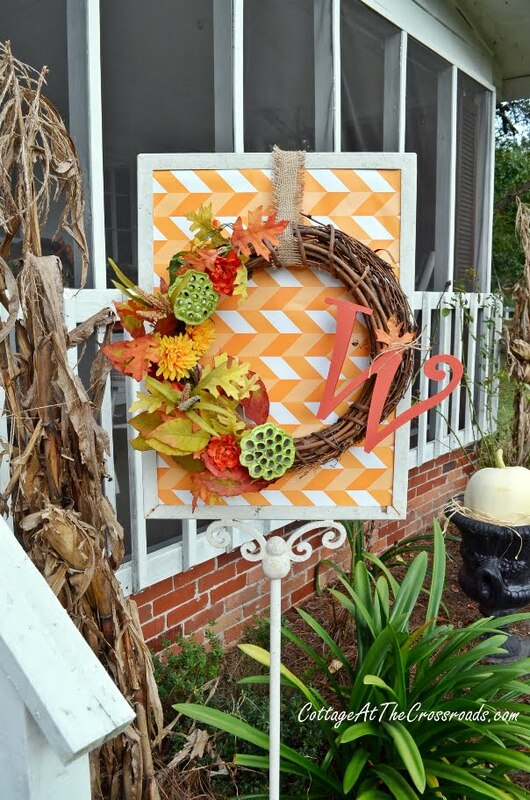 Your porch decorated for Fall is FABULOUS ! Love all your flowers ,scarecrows , and those white pumpkins :)! 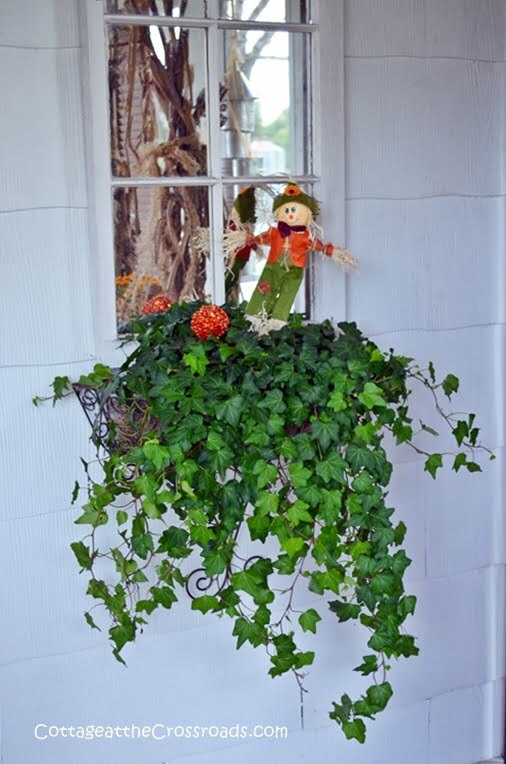 Leo and you have one of the happiest Fall front porches, Jane! I can only imagine how much you all enjoy sitting out there, while welcoming family and friends! 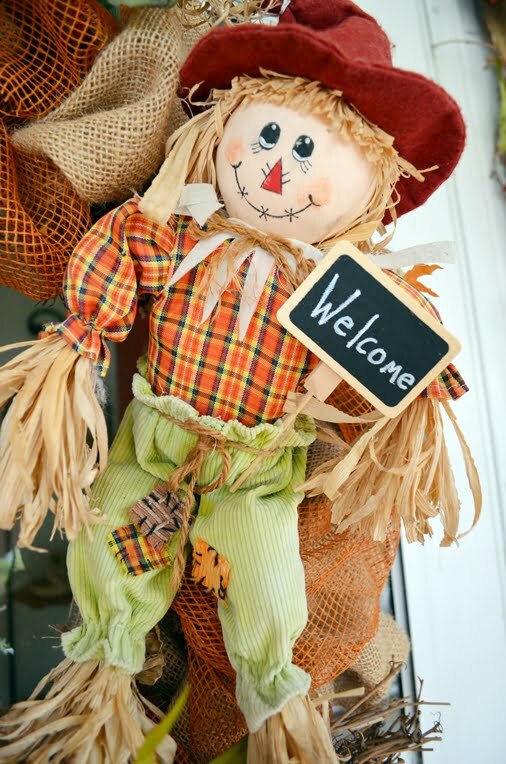 Love the garland … cute scarecrows … and, your tin man is too cute! Happy Fall! oh jane, what a treat to have dinner with you and Leo and to gaze at all of your adorable scarecrows on your lovely fall porch! Luv it!!! 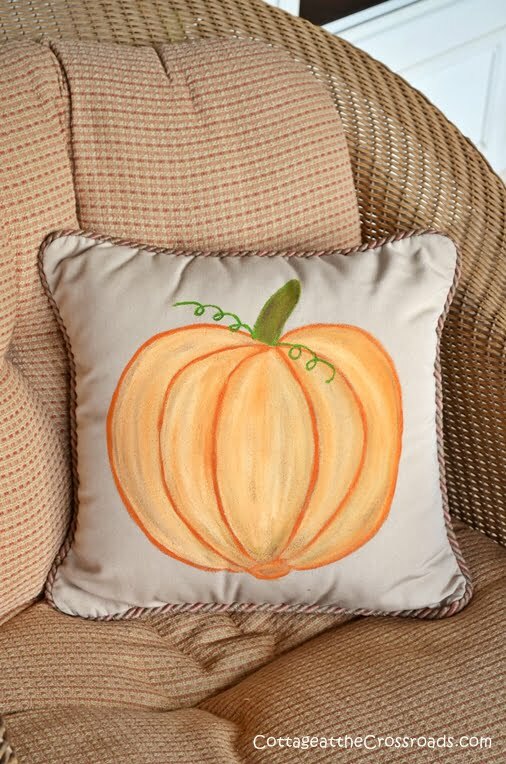 I especially luv the painted pumpkin pillow. 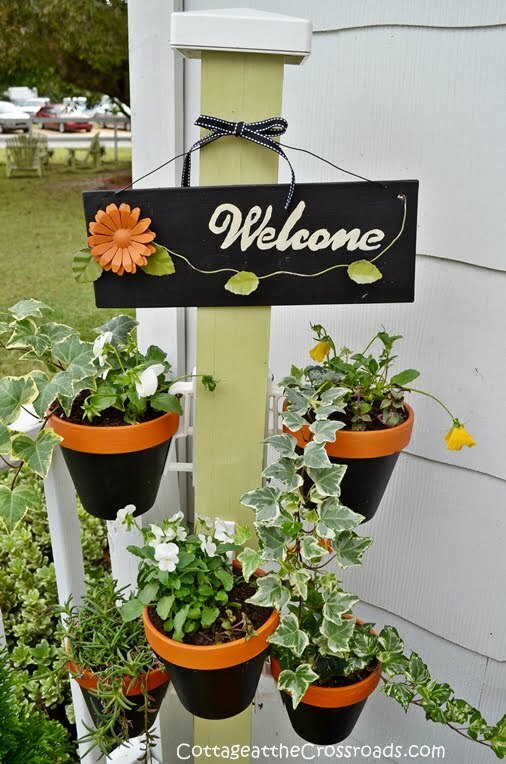 Your porch looks so cute and welcoming! I love all of your scarecrows and what a great picture of you and Leo!